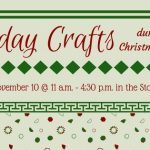 Attention all crafters! This session will explore finding ideas online as well as doing crafts digitally. Bring your creativity and learn more about your favorite craft and maybe a new one too! Tablet Tuesdays is a monthly class covering various useful skills for using iPads hosted by one of our Washington County libraries each month. Sign-up is required as space is limited. Please call the library where each session is being held to sign up. Are you the ultimate Harry Potter fan? Are you excited for the next Fantastic Beasts movie?! 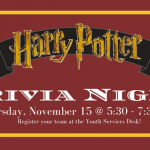 Join us for our very first Harry Potter trivia night! 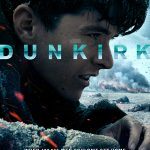 We will challenge you with questions from both the books and the films. Prizes will be awarded to the top 3 teams. Harry Potter or 1920’s themed costumes encouraged! Muggles of all ages are welcome to attend. *REGISTER A TEAM AND TEAM NAME BY CALLING THE LIBRARY’S YOUTH SERVICES DESK AT 262- 253-7760. Maximum of 6 people per team. Space is limited!